This entry was posted in Happy Clients and tagged Web development. 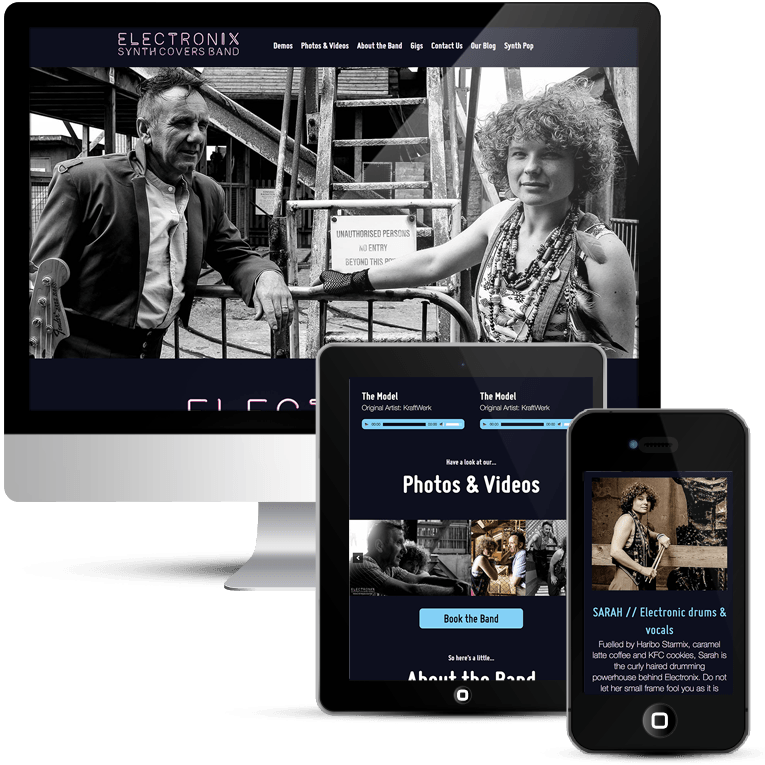 Electronix are a Synth Pop Covers band covering the whole of the UK. Sarah & Barry programme all of their music on the synth themselves, which is then played along to with live instrumentation and vocals at the event. This ensures that all performances are full of the energy and excitement that you would expect from a live band. This is a custom WordPress design but I don’t put it in my portfolio as the website design is not my own. It was designed by band member Sarah herself in her capacity as the Happy Designer. I designed and developed the WordPress theme for the website and blog. There are loads of images, they had a photo shoot done and they have some fantastic photos to display. The top image is static (I really love that one) but just below there is a carousel sliding across the page which contains photos and videos. They have amassed a whole load of testimonials in a short space of time and there is a slider for those too. Live audio tracks in the form of MP3 players enable visitors to enjoy the great music that this band makes. Calls to action are prominent and all of the gig dates are listed. There is a contact form and a blog all the way down to the last fabulous photo in the footer. Social media links are prominent too, word of mouth is pivotal to the success of the band. WordPress gives them all of the editing capabilities they need, there is nothing on the page that they cannot manage themselves. Naturally the site is mobile responsive and currently making its name in the Google rankings. They are doing incredibly well, deservedly so. Just remember to book them for your next event!